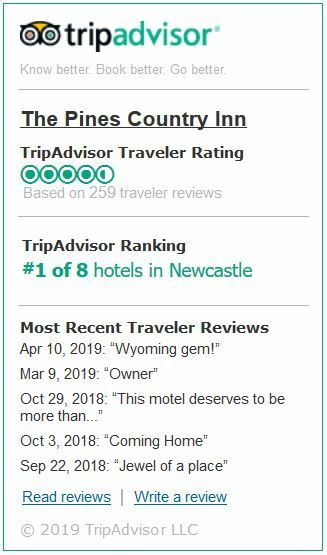 From The Pines Country Inn in Newcastle, Wyoming, you will find many great sites and attractions a short distance away, a sportsman’s paradise for hunting, excellent winter sports, and enough western charm to make you want to stick around a little longer. Newcastle, Wyoming is an ideal business location. US Highways 16 & 85 intersect at Newcastle and the Burlington Northern Santa Fe Railroad has a rail yard with 2 rail lines through Newcastle. No matter what direction you take from Newcastle, Wyoming, you embark on a drive through time marked by spectacular views, gorgeous scenery and plentiful wildlife. Our location is unique, representing the best of two worlds. The shortgrass prairie of the High Plains and the Black Hills meet - right here. Mount Rushmore, Devils Tower and other Black Hills attractions are an easy drive. From here you can lunch on the Canyon Springs Prairie near Custer's 1874 Black Hills route, drive the Cheyenne - Deadwood Stage Trail, or tour the shortgrass prairie's open and unending spaciousness - its sagebrush, ranches, tumbleweeds, antelope, prairie dogs, birds and more - echoing the past under unbelievably clear blue skies. For more information on the Newcastle area, please visit our Chamber website.